Sweet Corn, Bean, and Beef Casserole! - I Am Proud Of My Kids! Sweet Corn, Bean, and Beef Casserole! 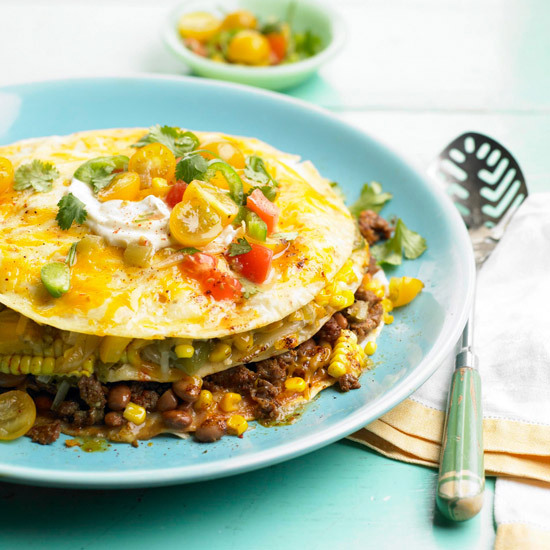 The mastermind behind this recipe, Joanne Weir, describes it as taking all the flavors we love in enchiladas and creating something even fresher. Topped off with tomatoes and cilantro, this casserole recipe had my mouth watering instantly, truly love at first site 🙂 Checkout the ingredients and cooking directions below, courtesy of bhg.com. Preheat oven to 375 degrees F. Cut corn from cobs; set aside. Grease a 9-inch springform pan, large oven-going platter, or a 12-inch pizza pan; set aside. 2. In a large skillet cook beef and chorizo until brown and cooked through, breaking up any large pieces with a spatula; drain fat. Add beans to beef mixture and heat through. Cover and keep warm. 3. In another large skillet, heat olive oil over medium heat. Add onion, sweet pepper, and garlic. Cook, stirring occasionally until tender, about 10 minutes. Add corn, salsa, chili powder, cumin, and cayenne. Cook 5 minutes, stirring occasionally. 4. Place two of the tortillas in prepared pan. Top with meat mixture. Reserve 1/4 cup of cheese. Divide the remaining 1-1/4 cups of cheese in half; sprinkle one half on the meat mixture. Add another tortilla, vegetable mixture, and remaining half of cheese. Add final tortilla. Cover loosely with foil. Bake 10 minutes. Uncover and sprinkle with reserved 1/4 cup of cheese. Bake 10 minutes more. Let stand 10 minutes. Remove sides if using springform pan. Top with sour cream, tomatoes, and cilantro. Slice with a serrated knife. Makes 6 servings. 2 Comments on "Sweet Corn, Bean, and Beef Casserole!" Thank you for sharing this recipe. I am printing so I can make it soon. It looks like it tastes delicious. Thank you.